Hello! It's been a crazy fall over here in the Butler household. I have two new books out, a new website, and am diving into the blogging world. Oh yeah, and I have a 3 year-old, a 1 year-old, and a very handsome husband that also needs my attention from time to time. Well since you are here, I would love to tell you a little more about my vision and hope behind my new devotional, Habits of the Heart. About 3 years ago, I became a mommy to a spunky, chatty, no-napping, wild child. I'm convinced she came into the world 8 days early because she had major FOMO. Anyways, I found myself exhausted, alone, and weirdly "busy" with a baby that only napped for 15 minutes at a time. (Yes, I know. You can feel sorry for me). I found myself asking, "How can I possibly grow in my relationship with God with so little time and absolutely no energy?" Well this is proof that God can bring good from hard seasons because 3 months after my first daughter was born, my vision for this devotional was born too. I wanted to create something that could give people approachable, simple tools to train their hearts to live life immersed in God. I don't know about you, but I am easily tempted to have the mindset that if I cant do something 100% then we may as well just not do it at all. A former spiritual director of mine, used to tell me “Anything worth doing is worth doing poorly." At first glance this doesn’t quite sit right. But let’s take it into the context of exercise. Exercising our body is incredibly important to our heath and is absolutely worth the time and energy. However, for many, time and energy are in short supply. But isn’t a ten minute walk better than nothing? Let’s take this into the context of relationships. If I only have ten minutes at the end of the day, isn’t it better to engage with my husband rather than wait for when we have more time? If I am honest, I have felt this way about spending time with God. If I can’t dedicate at least 15 minutes to him then I may as well not even try. But if something is really worth doing, isn't it worth doing poorly? Habits of the Heart is a 365 day devotional which goes through 52 different spiritual disciplines throughout the year. Each devotion is short - like really short. They can be done in minutes; however, the purpose of each day is to give you practical ways to practice spiritual disciplines as a way to connect with God throughout your day. My hope is that this devotional will be the beginning of a beautiful journey for you. That it will slowly change your habits, that God will come to mind more often, that you will be more aware of his presence, and that you will grow to love him and feel loved by him. You don’t need to have tons of time, lots of determination, or a life that is neatly put together before opening this book. If you only have 5 minutes, then give him those five minutes. You might feel like nothing really significant happened during that time, just relax and trust that God is doing more than you might think. The real work of the Spirit may often happen in the time between these devotions. I intentionally began this book with the discipline of "Practicing God's Presence," which means to awaken a constant attentiveness to God always being with you, working on your behalf. I love that this book begins with this discipline because it sets the stage for the rest of the year. My hope is that each reader who works through these devotions will grow to remember that God is with them in each and every moment. So because you took the time to read this blog (and you made it this far down the page!) I want to give you a little taste of what this devotional offers by giving you a practical way to practice God's presence with you today. First, read the verses below. "Because of Christ and our faith in him, we can now come boldly and confidently into God’s presence." Okay, you read those verse way too fast. Some of you didn't even read them. Take a moment to read each verse again but slowly, soaking in each word. Finally, I want you to take out your phone. Yes your phone! We live in an age of technology so why not use it as a tool towards our spiritual growth? Set an alarm to go off later today (lets say 6pm). When you see the reminder, pause to remember that God loves you, that he delights in you, and that he is with you in that very moment. That’s it. So if you are sitting in traffic when the alarm goes off, remember that God is with you in that space. If you are having a tense conversation, God is with you in that too. If you are frantically trying to get dinner on the table with two kids attached to your legs, God is with you, he loves you, and he will give you what you need to get through that moment. Life feels less scary and overwhelming when we remember that our constant companion and cheerleader is always by our side. This little step might feel too insignificant. Too simple. But how would your life be different if you took time to stop and remember God was with you. Lots of little steps towards God hold huge eternal significance. 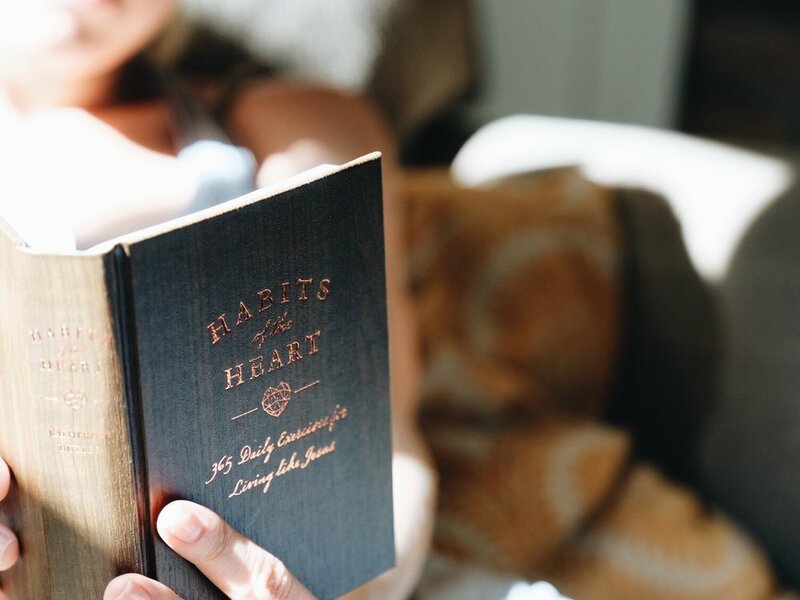 If you decide to purchase Habits of the Heart (here is my marketing push :) then you will have a full weeks worth of simple exercises to continue practicing God's presence throughout your day - and 51 other disciplines to work through as well. My prayer for you is this: Lord, may our “spiritual lives” become non-existent as we learn to see all of life as spiritual.